The suggested stitch height for Amazon is 5" - 12". Amazon was designed by Lorien Quilting. 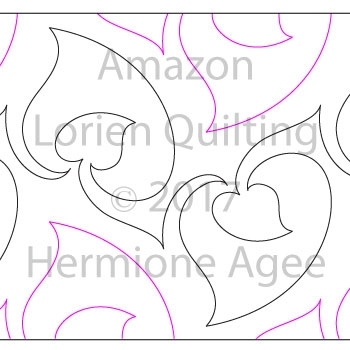 I bought this design for a customer's quilt since she wanted a leaf design that wasn't too dense. This design was perfect for her quilt and she loved the finished product! No over stitching and size can be increased or decreased to meet your needs. Will definitely be using this one again and again!